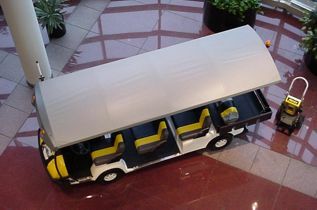 The base for the vehicle: The E-Z Go 955 Shuttle. 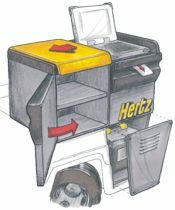 This was stripped of its seats and cargo area so we could design a unique Hertz vehicle. 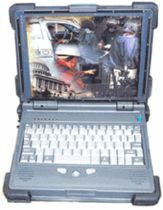 Due to the abusive nature of an outdoor vehicle environment, a “ruggedized” computer was chosen to handle the customer reservations system’s computing needs. 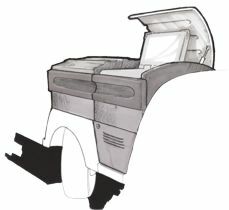 Luggage capacity was a major design requirement. 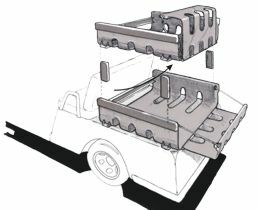 Early sketches explored the difficult task of retrofitting new components to an existing product and creating a distinctive look. 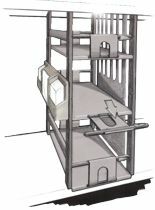 A self-contained workstation unit was proposed which would house and protect all computer and printing equipment, batteries and the required charger and power inverter. 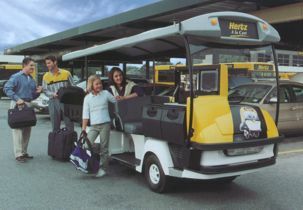 Several storage configurations were explored to handle the diverse luggage requirements in different parts of the country. Sketches like these never left our office, rather they helped us to sort out the hundreds of smaller design problems involved in such a large project. 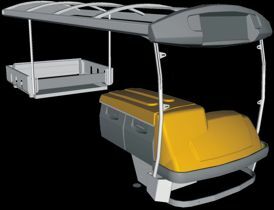 This concept sketch depicts a specialized charging cart, one of the support products which arose out of the client’s very specific needs for this project. Color hand-drawn renderings communicated the final proposed concepts to the client. This large project was composed of several smaller projects, all being designed concurrently to maintain a cohesive whole. 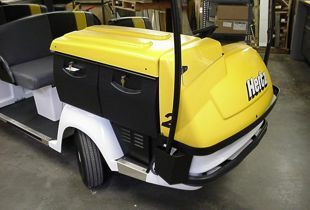 A combination of foam mock-ups and actual fabricated components were built upon the base vehicle and presented to the client to generate feedback. 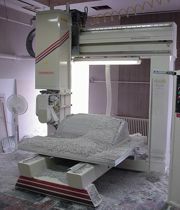 A wood version of the workstation was constructed and filled with all the required equipment, which was actually powered on during the client presentation. 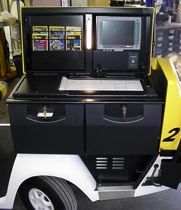 Both this Mechanical Desktop model of the charging cart and the final fabricated metal product are nearly identical to the original sketch concept. This “quick and dirty” color study was used internally to make efficient design decisions. 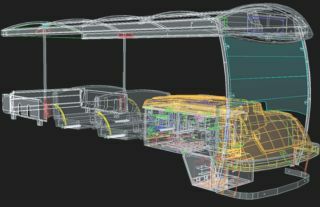 A series of Mechanical Desktop models integrated over 150 metal, wood, and plastic parts into a flexible and updateable data file. 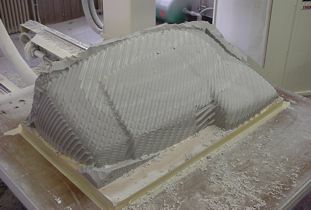 Data files from Mechanical Desktop were used to machine high density urethane into the tooling required for the seven different thermoformed plastic components. A 57-page manual was generated to assist our own assembly and wiring of the 237 carts which we shipped to the client. 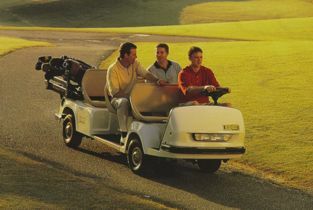 A copy of this manual was sent with each cart as a maintenance reference. The final charging cart, built on an off-the-shelf hand truck from a single welded steel assembly to which the chargers were mounted. 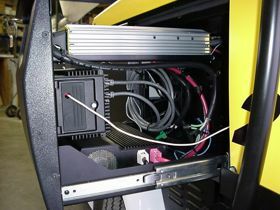 Clear labeling and wire management helped the client’s personnel perform a fairly specific charging procedure. 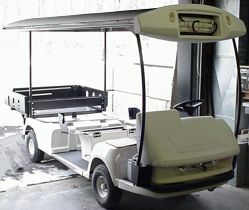 Cart Number “2” was the first “prototype”… all parts were made in both the material and process of the finished product. Few major changes were necessary beyond this prototype. 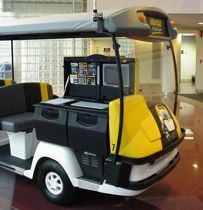 The finished product is a mobile, wireless, weather-resistant “people-mover” from which an entire rental transaction may be performed, as is often necessary in the busiest locations.